I have used my iron more in the past few months than I have in the past five years. Combined. Now before you all get to thinking that I have become ultra domestic, please don’t. You know I would never disappoint you in that way. A couple months ago Cody went to his friend A’s house after school to play. He was only there for about an hour. During that time A’s mom had made fresh chocolate chip cookies (which, much to her chagrin Cody refused to eat because he is a strange child who does not like cookies, the only exception being Newman-O’s), organized an arts and crafts project for the boys, and was in the process of feeding a snack to her three year old and ten month old when I showed up to get Cody. 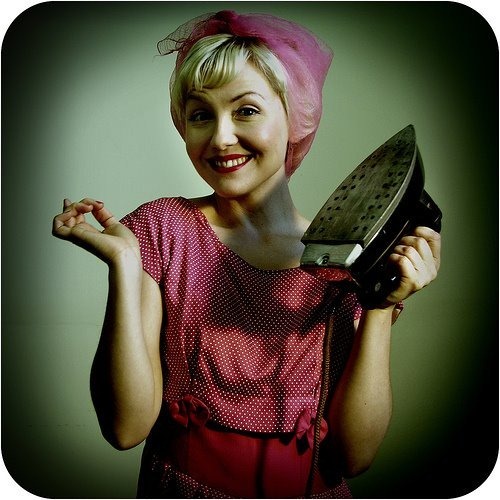 She also had her iron plugged in and ready to go on her kitchen counter and I thought to myself she actually has time to iron during a play date? This thought was quickly followed by another, she actually irons? She was, in fact, not ironing. Well, she was not ironing clothes that is. She was ironing the arts and crafts project. The boys had made some cool designs with these things called Perler beads and she was ironing them. I had never heard of such a thing, being the non-crafty person that I am, but they looked simple enough. 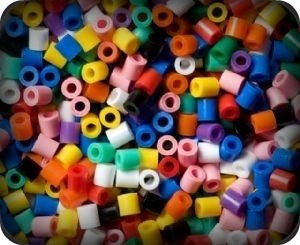 They are plastic beads that come in lots of happy colors that you place on shaped peg boards. You then put a piece of waxed paper over the top and iron them so they melt and stick together in the design of your choice. If you are clever and wish to be an overachiever in the area of arts and crafts you may lace your design on a string to make a necklace, or glue a magnet to the back and stick it on your fridge. My first thought on seeing Cody’s Perler bead design was wow, he did this all by himself? You see, with Cody’s cerebral palsy he has difficulty with fine motor activities. And this was all fine motor. A’s mom told me that he did have a hard time with it and she had to help him quite a bit but that overall he enjoyed doing it. 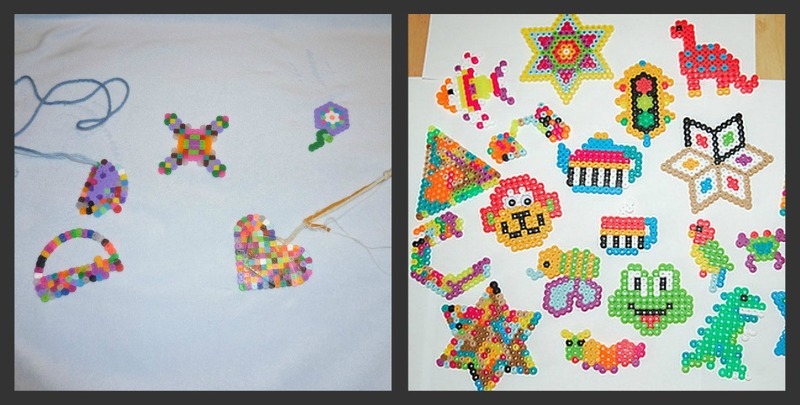 Some of our family’s Perler designs are pictured on the left, the heart is what Cody did at A’s house. The picture on the right I found on the internet as an example of what a more creatively inclined family might do with the beads. That was all it took. Any activity that Cody will do, and can have success at, that involves working his fine motor skills, I strongly encourage. Even if it means dusting off my long lost iron. I just hope no one in this family gets any ideas about me actually ironing an article of clothing for them. My policy of running to the dryer as soon as the buzzer goes off and draping the wrinkle prone pieces of clothing over the hamper if I can’t hang them in the closet right away typically results in an only very slightly unkempt appearance for the end wearer. This works well for myself and the boys, while Husband takes his dress shirts to the cleaner for that nice pressed appearance. This entry was posted in Little Feet and tagged Children, Crafts, DIY, Family, Honestly do people really iron anymore?, Ironing, Projects. Bookmark the permalink. I always manage to ruin a white shirt approximately 1x/2-3 years thanks to my forgetting to wipe the dust off the iron before I go to it…great post! Much better idea to iron perler beads. How neat that Cody was able to work with the beads – beautiful! The beads are a lot of fun! I love those Perler beads, though my kids have outgrown them, and like you, they are about the only thing I’ve ironed in the past 30 years. I think ironing is overrated. I just make sure to buy clothes that don’t require such care. I am so glad that Cody had fun. Perler beads are loads of fun. I still have a giant twizzler container filled with perler beads from when I was younger. I can’t wait till my son is old enough to play with them. Is it that you can’t wait until your son is old enough to play with them or that you can’t wait until he is old enough so you can bust them out and play with them yourself using him as an excuse to do that? 🙂 I bet you will totally rock the Perler beads. hahaha! I have been caught! Honestly a little of both. I think he will really enjoy them and they are great stress relief for myself. Irons are so versatile! I love hearing about ways I can use mine that don’t include ironing my husband’s work khakis. I have yet to make a grilled cheese with my iron but that’s on the docket. I only iron when I absolutely have to. Cody’s OT uses a Lite Brite with him and my mom has one up at her house. It holds his attention for a while but I think he prefers the Perler beads because he has something as a end product once he is done. I used to love Lite Brite as a kid! My kids loved ironing the beads. Our Montessori art guide set them up as a shelf work for the 3 to 6 in her room. Some of the 6 to 9’s were tasked with ironing the creations. I haven’t let my boys do the ironing part with the beads yet although I bet my almost 6 year old would be up for the task. My mother never ironed. I don’t know if we even have an iron in our home now. However, my children also have motor skills issues – maybe we should invest in an iron.